Saag Paneer is a standard Indian dish consisting of fried paneer, an Indian cheese, on a bed of sautéed spinach. This is my variation. I’ve got a couple of go-to recipes for quick meals that don’t take a lot of time or work but are presentable enough for guests and this is one. A fave not just as a vegetarian spin, but also because it’s very tasty. I usually keep a block of paneer in the fridge and pretty much always have some greens, onion, and garlic around, so it’s on the table in half an hour. Which isn’t to say that you can’t take your time and make it better Yotam Ottolenghi has a recipe for paneer that’s astonishingly easy. If you don’t know who Ottolenghi is you need to find out now. The London-based restauranteur and cookbook author has a couple of books out now and they are intoxicating. Simple dishes with a world of flavor. But back to Saagish Paneer. Usually the cheese is fried and the green used is spinach. 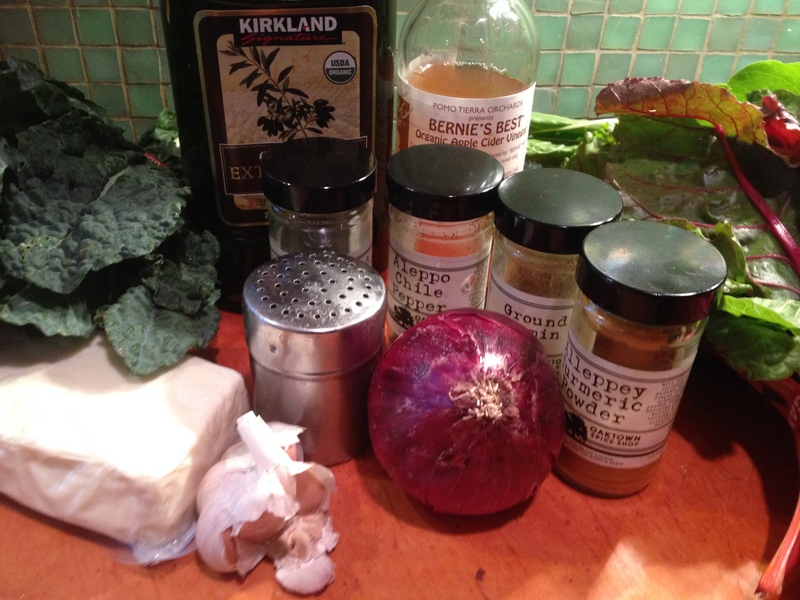 I like to roast the cheese and use kale and chard to get a little more assertive flavor in the greens. 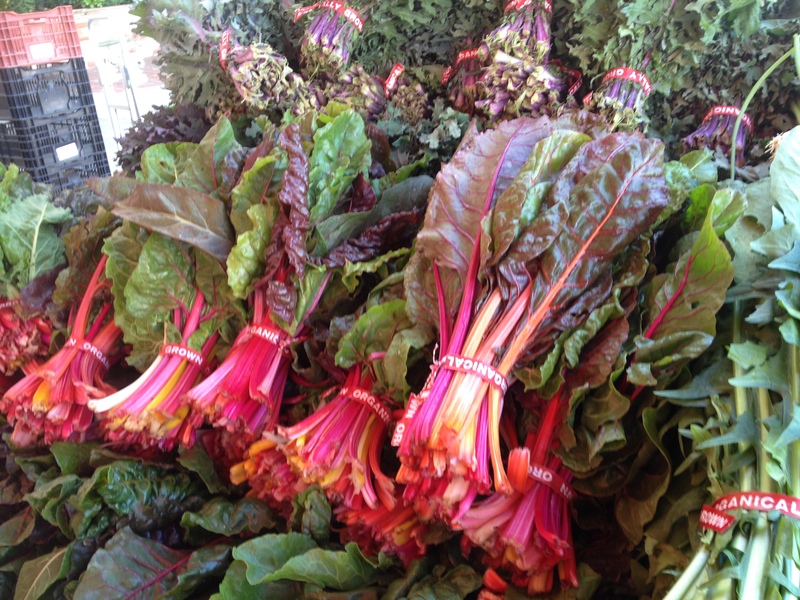 There is such beautiful chard in the market right now. This came from Dirty Girl Produce who are at the Berkeley Tuesday market and at the Ferry Building on Thursday and Saturday. Strip the kale leaves from their stalks and blanch in boiling water for two minutes. Drain in a colander and chop into small bits. Strip the chard from the stalks and chop the stalks into dice. Add the olive oil to the pan you blanched the kale in and add the onion and chard stalk to the pan and sauté until wilted. Add the chard leaves, smashed garlic, and kale leaves. Saute until chard wilts. Add cider vinegar and a cup or so of water. Turn the heat down a bit and continue cooking adding water as necessary so that it doesn’t dry out. Once you’ve got this going, cut the paneer into ½” by ½” by 2” pieces. Mix the 1/3 cup olive oil and spices together and whisk. Add the paneer to this. Pour out on to a sheet pan covered with parchment paper and roast for 20 minutes at 400° for 20 minutes. Check at about 15 minutes to see how it’s doing. When the paneer has a good light brown look to it, take it out. Put the greens on a plate and top with the paneer. I love that people are talking back to me. I hate that I haven’t been completely clear. I use a lot of ingredients and some people seem thrown by not having the specific thing I’ve called for (preserved lemon I hear you calling). I’ll try to offer some alternatives for items in the future. Note to Kathy: you can substitute some lemon zest mashed with salt for the preserved lemons. Peter Moore lives, shops, and cooks in Berkeley, California. A co-founder of San Francisco’s Roxie Cinema, he worked in the film world for many years until the lure of food drew him into the world of professional cooking. Shortly thereafter, the lure of day shifts and a medical plan drew him out of restaurants, but his love of cooking remained. He is currently an intern at The Crucible in Oakland and an Operations and Development Associate for the San Francisco Silent Film Festival. 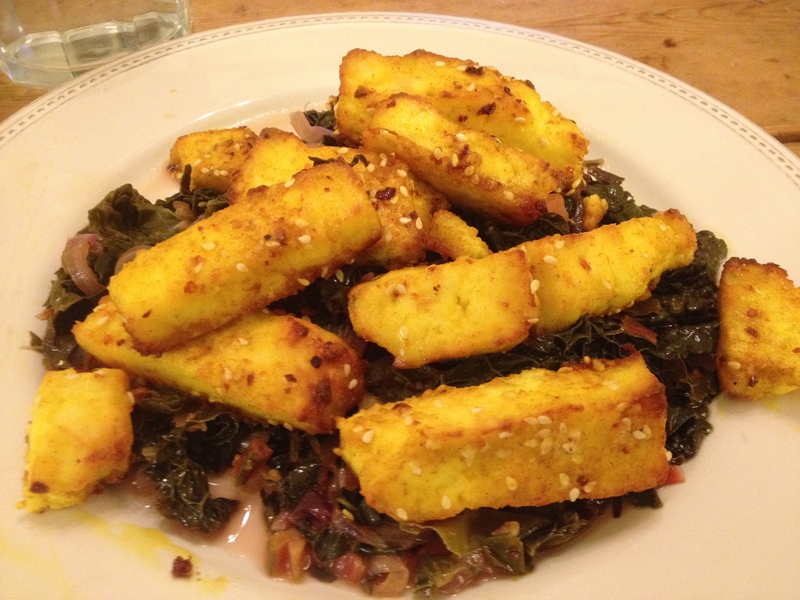 This entry was posted in Eat and tagged cheese, Indian, rainbow chard, recipe, Saagish Paneer, swiss chard, The Secret Restaurant. Bookmark the permalink. I finally got around to making this tonight, and it was delicious. I think I will go a little lighter on the onion next time. The paneer, oh the paneer, I loved it!